When a cell contains Zero as its value, it is still retained and is not removed by default in Excel. 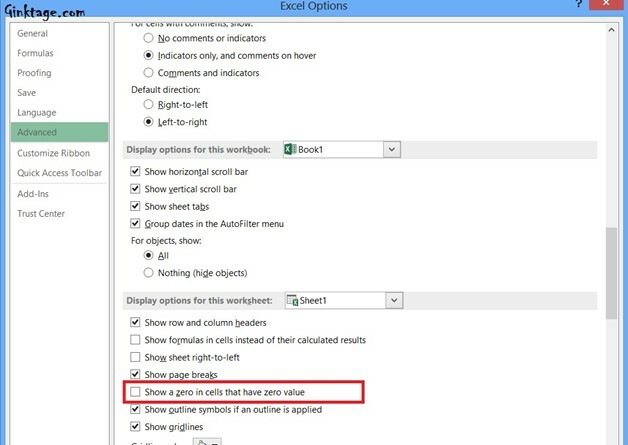 This behaviour can be easily modified by disabling a small feature or option in Excel 2013. Follow the below steps to display blank cell when it contains zero in Microsoft Excel 2013. 1. Launch Microsoft Excel 2013 and click File -> Options. 2. This will display the Excel Options Dialog. In the Excel Options Dialog , click “Advanced” in the left sidebar and then under the “Display options for this worksheet” group , uncheck/disable the option “Show a zero in cells that have zero value” and then click OK.
3. This will make the cells that contain zero to blank.